I knew I still had this kicking around somewhere, and recently I found it in an envelope labeled "Medieval Prints, etc." 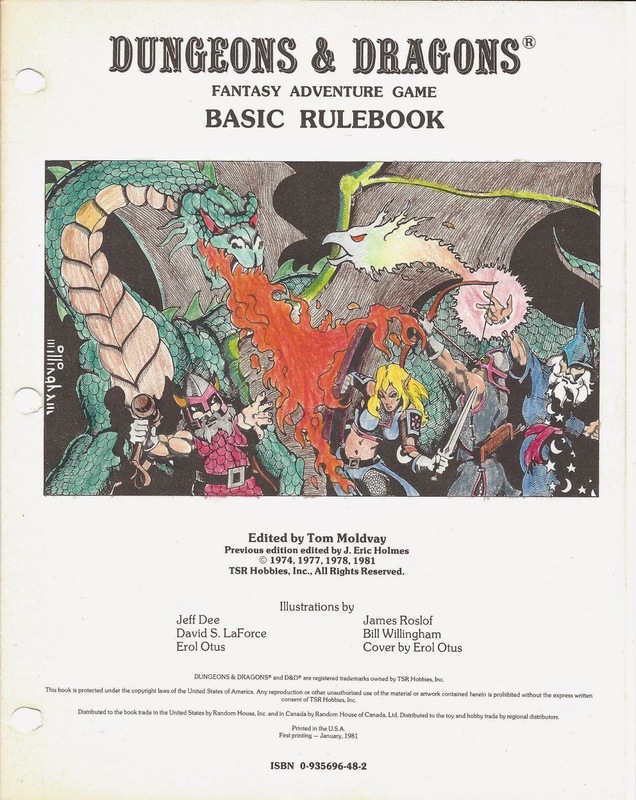 I present to you, for your amusement and edification, my first game hack and the board game/minis/RPG crossover game that paved my way into D&D. and saved this much of the cover. 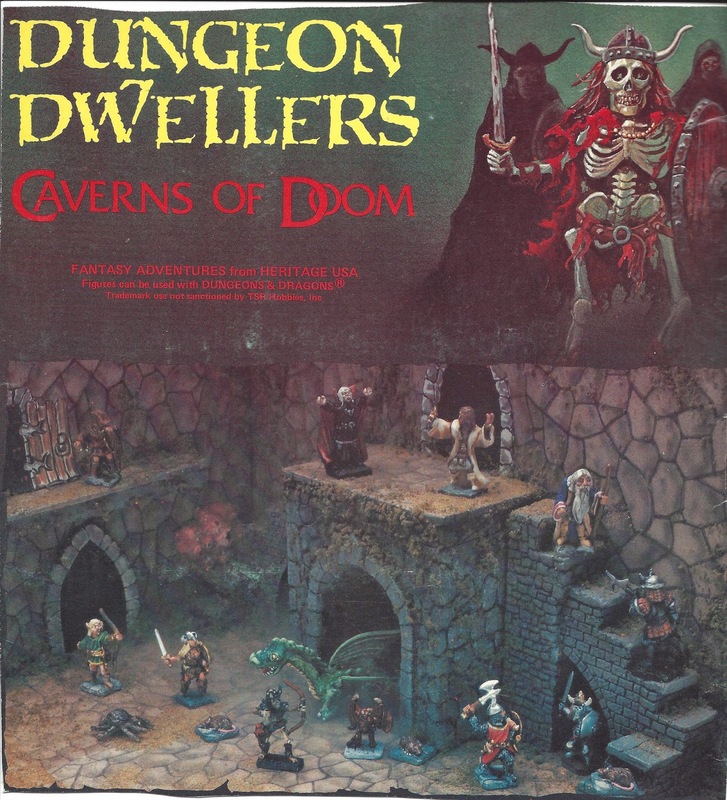 Back in 1980, possibly for my 11th birthday, I received a copy of Caverns of Doom. Check out its BoardGameGeek page if you want a full copy of the rules and map. It was a cheap D&D knockoff in board game form, complete with lead minis and a cheesy little painting kit. It had a fold-up dungeon map printed on card stock. 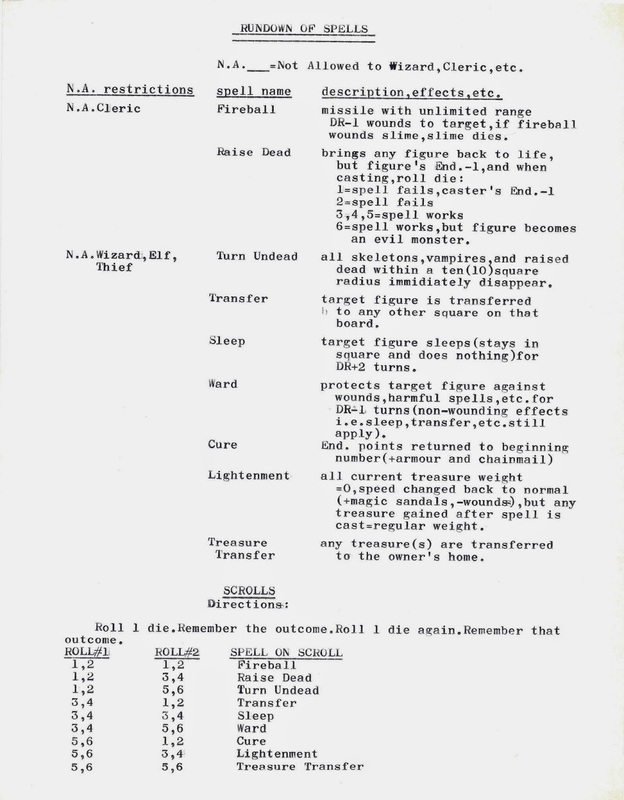 The dungeon overflowed with monsters and treasure, populated anew in every game using die rolls against a table. I don't think it came with dice, but I scavenged a couple of six-siders and went to town. It scratched an itch I never knew I had. I solo-played the hell out of that game. I had a copy of Outdoor Survival (BGG link) that I talked my father out of. I had no idea that it was on the recommended equipment list for OD&D, but it had a wilderness map with houses (which could just as easily be town, castles, or portals). Like any good Avalon Hill game, it had piles of chits to use, so I made chits for treasures, monsters, and gateways to alternate worlds. I had my intrepid adventurer journey across the map and across game boards, vanquishing evil and hoarding treasure. Suddenly Caverns of Doom wasn't enough. I had Feudal (BGG link) and Wizard's Quest (BGG link), so I statted out the pieces in both of those games and pulled them kicking and screaming into the system I hacked together. Magic Resistance. Mmm... Smell that Monty Hall. and variable treasure value systems. table to lower your Speed and Fighting Ability. 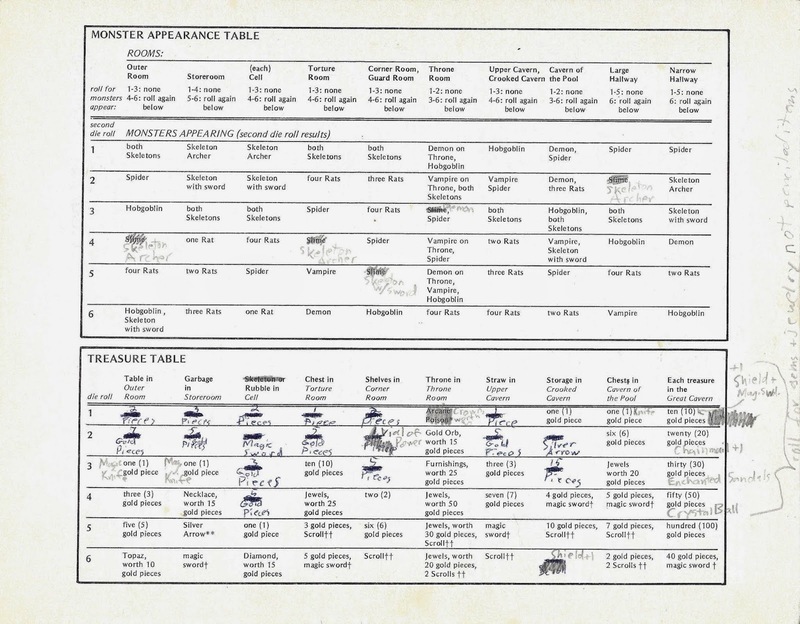 Character tables for Feudal. They're advanced enemies. Personal Treasure for Feudal enemies. I had a manual typewriter, and I used it. Often. 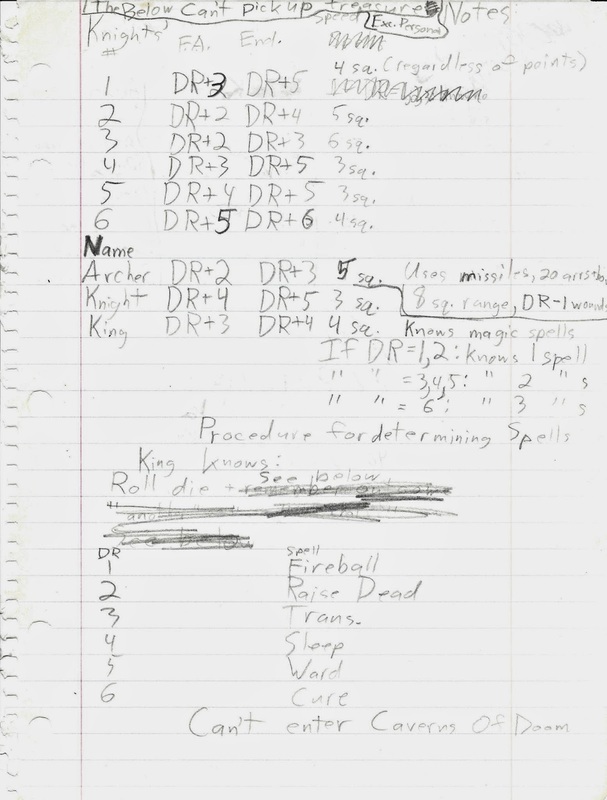 I added spells (like Lightenment) and a 2-die scroll table. New magic items and encumbrance! Check out that Vial of Power. 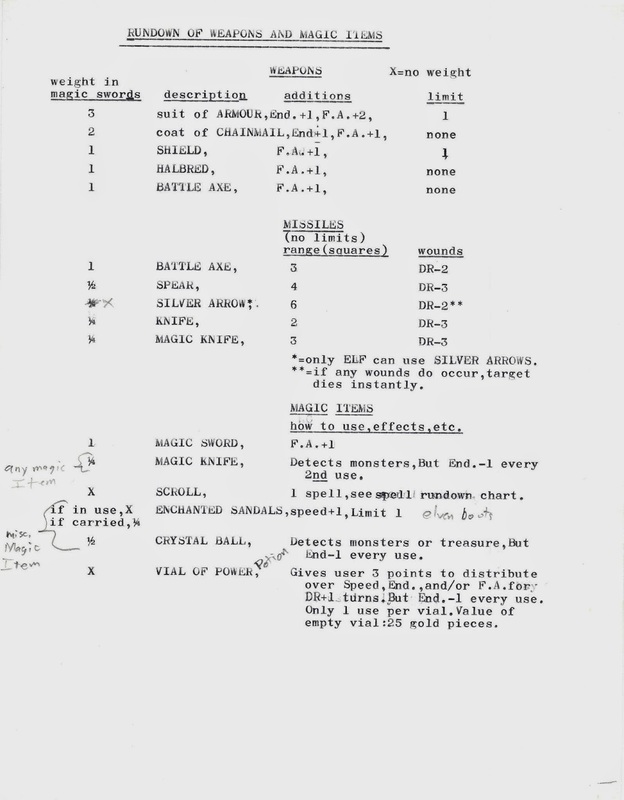 a chart on a manual typewriter? I do. penciled in for good measure. 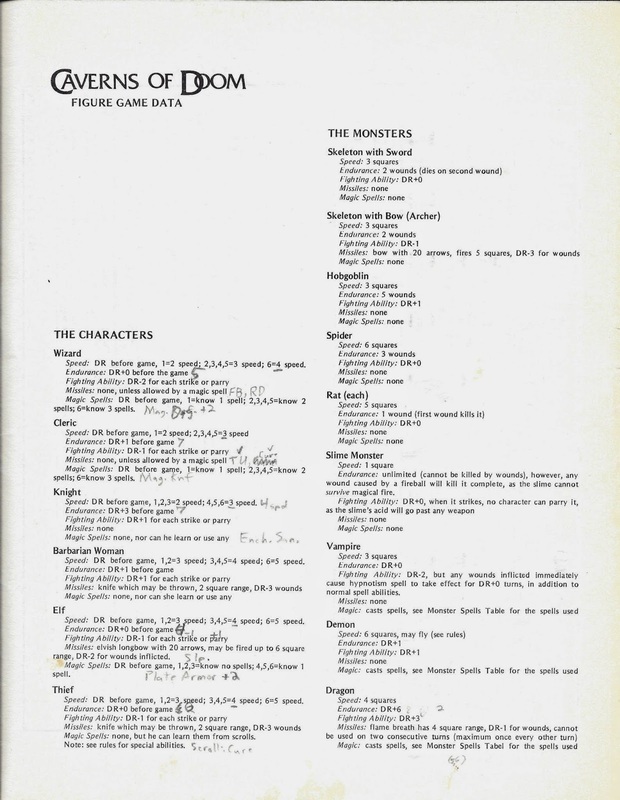 Later in 1981, I picked up the magical magenta box containing Basic D&D as edited by Tom Moldvay. Back then I "improved" game books with colored pencils. I still like how it turned out, especially the magic missile. 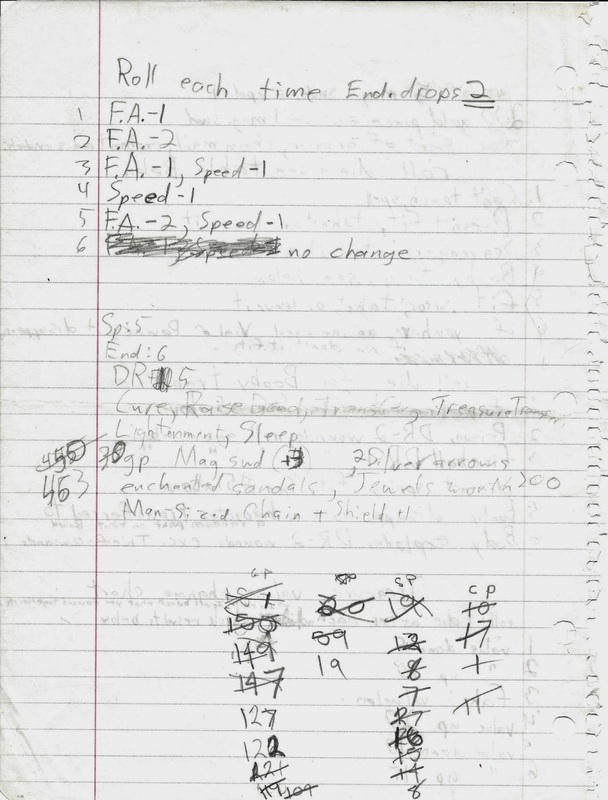 I remember being in the back of the car on a rainy night, pulling out from Spag's onto Route 9 as I opened the box for the first time, flipped through the rulebook, and got sucked in. 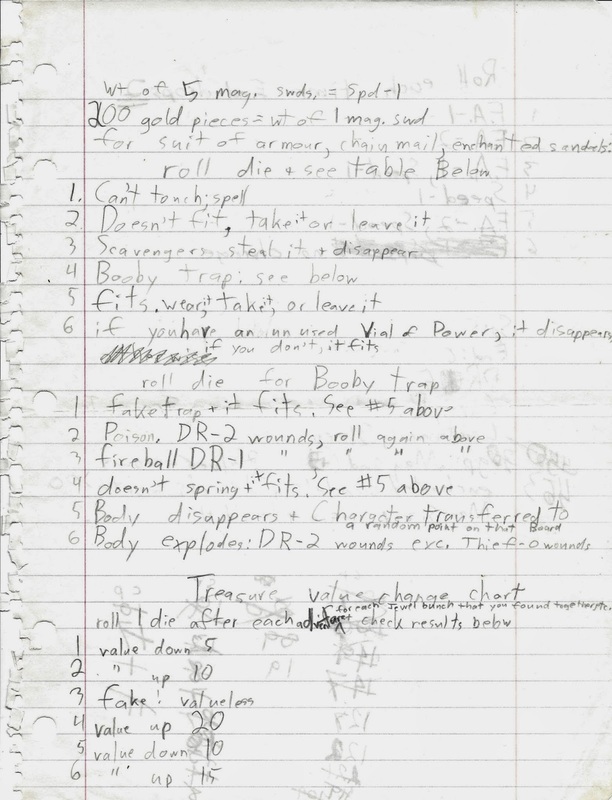 I used birthday money to buy the AD&D Players Handbook and started mashing D&D and AD&D rules together in a shifting homebrew. From then on, whenever I could swing it, I biked to Spag's to read through or pick up an AD&D book, or to Book Corner to buy a Dragon Magazine. My first issue of Dragon was #59 from March 1982 with the Traveller adventure centerfold. 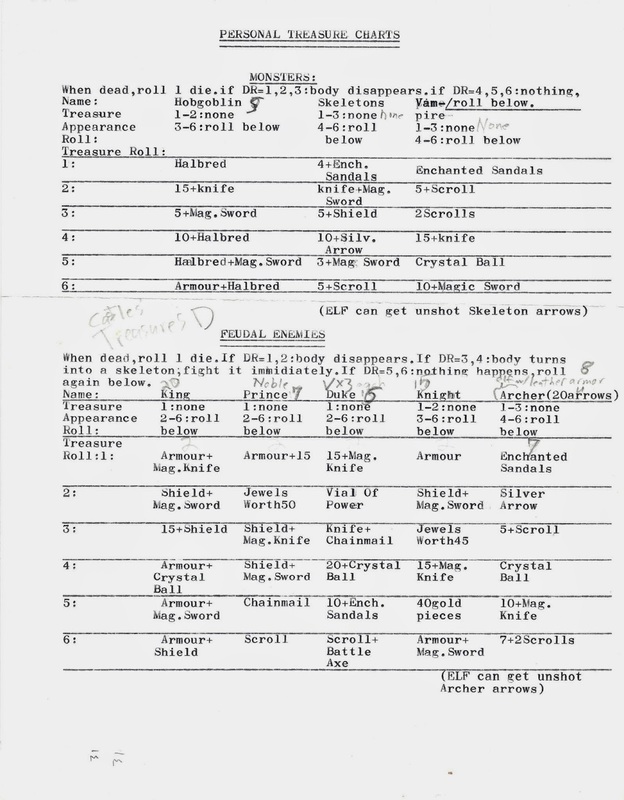 Later I went back and updated my UberGame with D&D stats, which you can see on the typed sheets. And apparently the castles in Feudal had an AD&D Treasure Type of D. Eventually I tired of the board game sprawl and focused my energies on AD&D characters and dungeons, but I still have the (badly painted) minis. 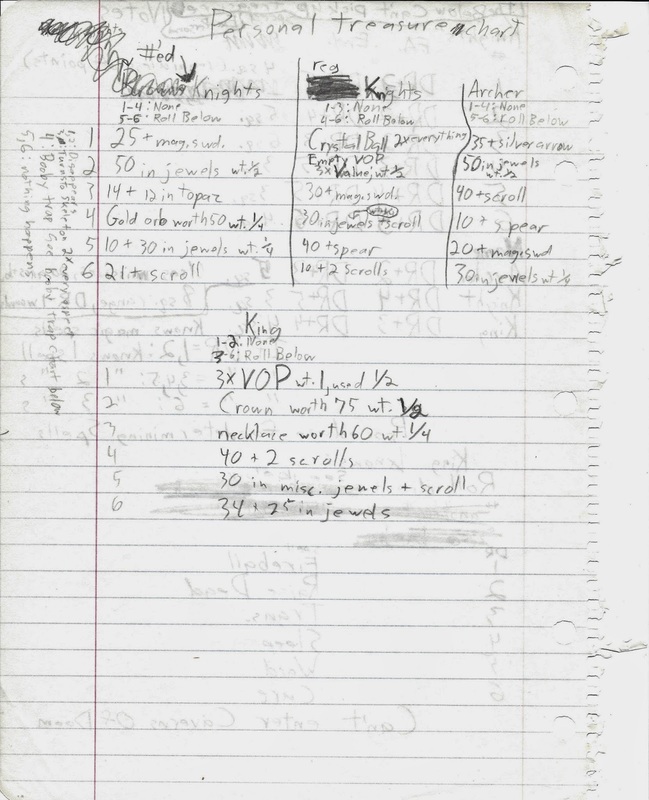 And now you have my notes and hacks. Not bad work for an 11 year old loner, eh? That's where it all began for me almost 34 years ago. What's your story? Now this is just all kinds of awesome! It takes me right back. There are days I still feel like I'm 12, creating dungeons for the heck of it and rolling up characters that I'll probably never play. Thanks! 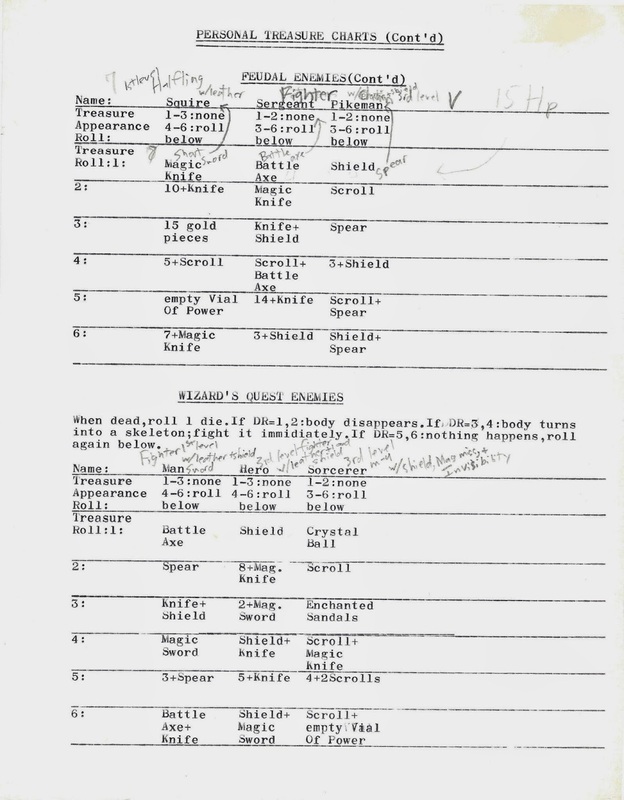 Though a Xanth RPG sounds very cool.